Cover Australian FedSat Satellite: FedSat was launched as a "piggyback" payload by H-IIA Flight No. 4 from Tanegashima Space Centre on 14 December 2002, together with the Advanced Earth Observations Satellite ADEOS-II and the Japanese microsatellites WEOS and ƒÊ-LabSat. Satellite broadband is coming. I can say this because BSS is building Kaband payloads and satellites for multiple customers pursuing satellite broadband business models. As a spacecraft builder and technology provider, it is up to BSS to supply the advanced space infrastructure to support these customers. The Future of Communications and Satellite Systems by JOSEPH N. PELTON, Ph.D.
"The future of satellites and wireless will be largely determined by applications and not technology, and by the merging of digital services and systems, the so-called 5 C's. The 5 C's are communications, computers, consumer electronics, content, and cable TV. And I think we are seeing a vast merger of all those types of digital services connected by digital technology." Keynote speech of the 21st AIAA ICSSC presented by Prof. J. N. Pelton was posted here. Recently, the Inmarsat service for the land mobile users has gradually become popular, especially for the sake of the establishment of the communication system even in the region without communication infrastructure. The latest service is "M4 service", in which 64 kbps data transmission capability. KDDI Msat presented the latest information of the M4 system. "Three space development organizations in Japan, National Space Development Agency, National Aerospace Laboratory, and Institute of Space and Astronautical Science will be integrated as Japan Aerospace Exploration Agency, Incorporated Administrative Agency. The integrated organization will restart as an incorporated administrative agency on October 1, 2003. An outline of the new organization is briefly introduced here. This is the 30th issue of Space Japan Review. 1st issue was published in February 1999, nearly four and half years ago. 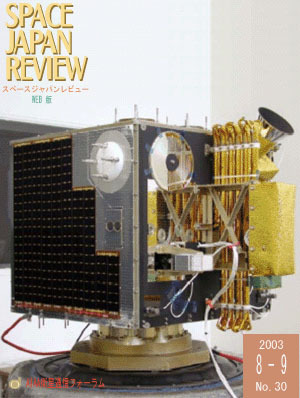 In March 2000, a first Anniversary special issue was published, in which Dr. Sekimoto, first Chairman of the AIAA Japan Forum on Satellite Communications, appeared in the Special Report, and Dr. Taniguchi, current Chairman appeared in the Interview with CEO, this, I believe, implicitly predicted the success of the AIAA Conference and Exhibition in Yokohama this April. AIAA Japan Forum on Satellite Communications will enter a new term with 3rd Chairman and new Board Members in October. Though the Japanese economies as well as the satellite industries are still struggling, new Forum members will do their best to promote its activities including publication of Space Japan Review. Your support and comments for the Forum and for Space Japan Review are much appreciated.